The Lenovo Yoga 3 Pro is the slimmest convertible laptop that you can buy today, but Lenovo's pricing really seems to be off the charts. When you look at the Lenovo Yoga 3 Pro for the first time, you know one thing, this product is all about the design. Then, you get to know it costs Rs. 1,14,990 and you go into shock. 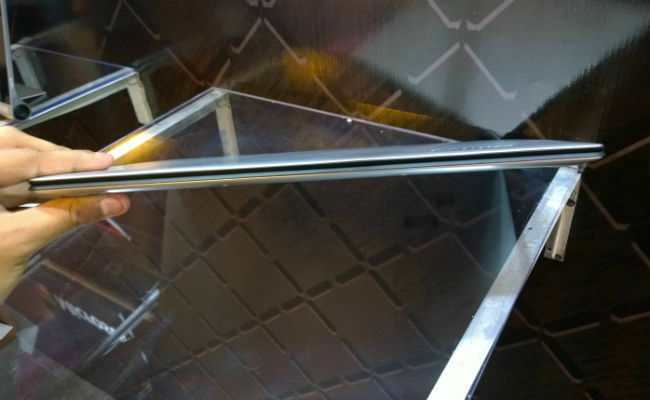 The Yoga 3 Pro is only about 12.85mm thick and weighs only about 1.1 kg, which makes it both slim and extremely light. You’ll carry it around with one hand, without any issues. Also, the watchband inspired hinges on the back are unique to this laptop. Unique, but not necessarily good. On the grey model, the bands seem to blend in with the rest of the laptop, offering no visual value of their own, except when seen from the back. Overall, the Yoga 3 Pro is a good looking laptop, but nothing really out of the ordinary. Good photography and post production of marketing images may make it look good, but it appeared pretty plain on first look. The slim and sleek design helps when you put this laptop in different positions but that’s about it. The visual aesthetics really aren’t as awe-inspiring as they appear in marketing images. It has a 13.3 inch QHD display and colours looked good on it. That said, the lighting conditions at Lenovo’s experience zone were really bad to pass any real judgement. The Corning Gorilla Glass on the display though makes the display feel quite premium and nice to touch. What makes me wonder even more about the price is the performance. The Yoga 3 Pro runs on an Intel Core M processor, which has been designed primarily with mobiles in mind. The processor aids fanless and slim designs, which works in favour of the Yoga 3 Pro. It does so though, by compromising on performance. See where I’m going with this? The Rs. 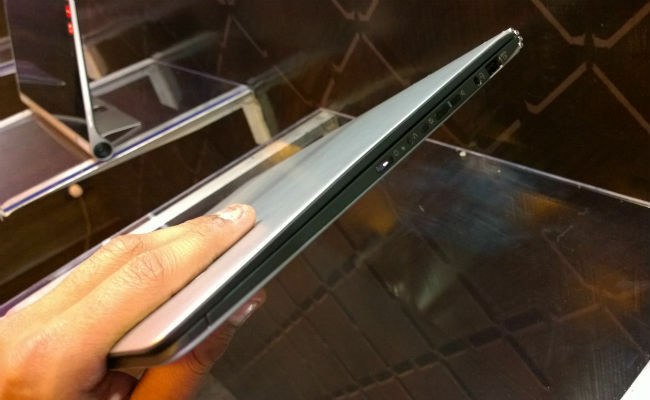 1 lakh plus price tag on this ultrabook means we’ll all beg for good performance. The Core M’s compromise may very well make this device not worth the price. One thing that the Core M should do though is offer good battery life. Overall, the Lenovo Yoga 3 Pro isn’t a bad ultrabook. I like the fact that it's slim and light and I like the display, but that’s about all. I’m unsure of the performance at the moment and the design isn’t really revolutionary enough to spend over Rs. 1 lakh on it. 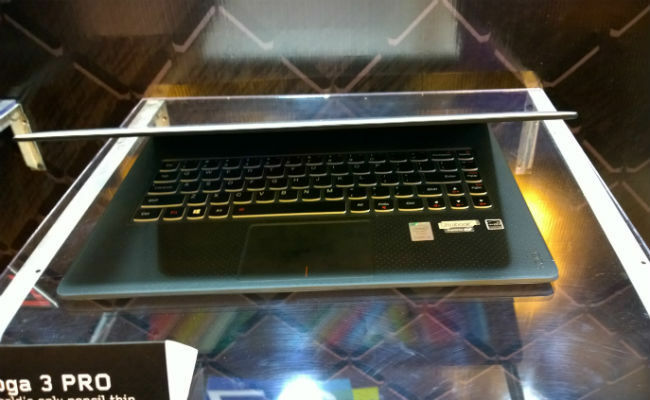 We’ll of course review the laptop before we pass our final judgement, but strictly from an initial point of view, I’m not quite convinced with Lenovo's pricing decision.